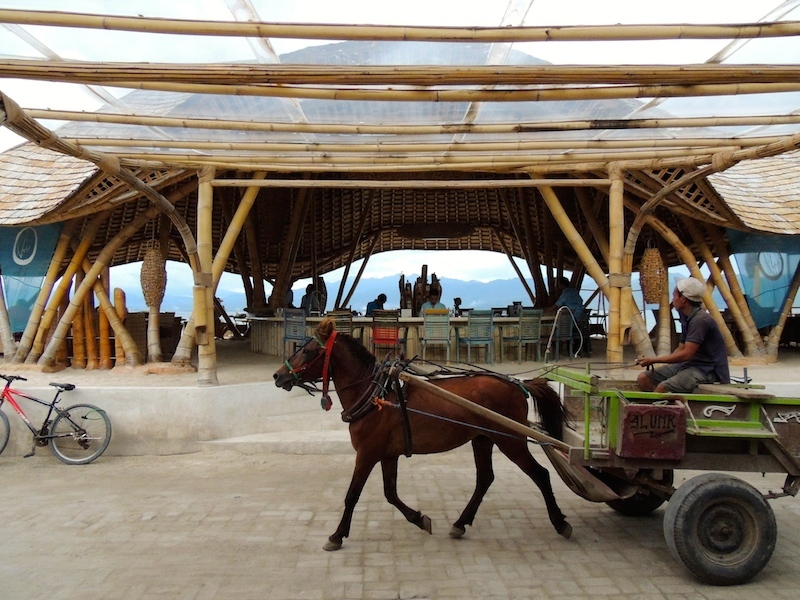 The Charm of Gili Trawangan – These Two Eyes! 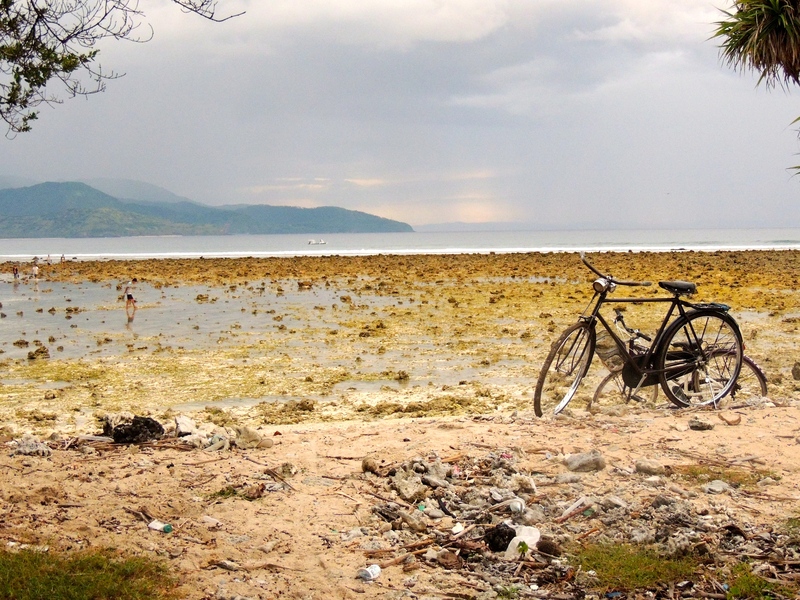 Gili Trawangan was once a hidden treasure that only backpackers knew about. A small island off of Lombak, there was a time where Internet bookings didn’t exist and half of the island was uninhibited. This has quickly changed, and in recent years development has escalated at an unfortunate pace. The evidence was apparent, but the renowned party island still has its unique charm. Standing in the middle of the main street with luggage in tow after exiting our fast-boat from Bali, it was a surprising quick dash to the make-shift sidewalk to dodge a cidomo, the brightly colored horse and carriages that double as both people movers and local transport. A nice escape from bustling Melbourne, there are no cars on Gili T, so getting around consists of your two feet, a cidomo or a bike hire from the many vendors up and down the main drag. Come prepared knowing that most bikes are sea-rusted and it’s hit or miss to get a good one. Luckily Eileen, Louise and I found the Triplets, 3 pink and green matching bikes that were not only quality but made us look really fashionable in unison. Accommodation on the island can vary from boutique hotels for around $200 a night to a fan-only room down one of the back streets for about $15 a night. 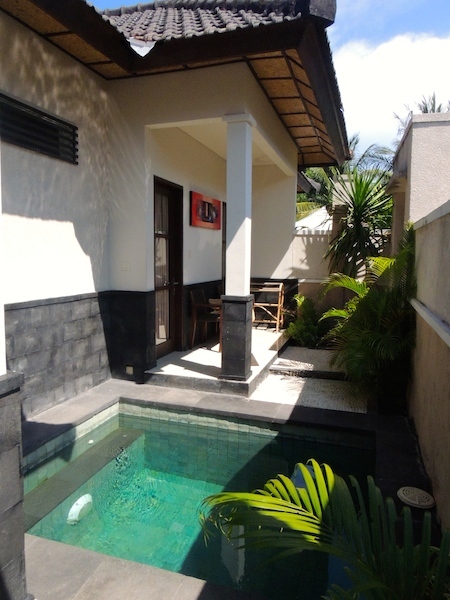 Like most places in Southeast Asia, it can be cheaper to not book ahead and haggle your way to a pillow, but we landed on Black Penny Villas in which we pre-booked via Agoda.com to be safe since it was over the Easter holidays. Our two bedroom villa, private plunge pool included, was in a great location halfway between sunset and the boat terminal. It was decent enough; despite some questionable Trip Advisor reviews however if I had my pick and was willing to shell out a bit more cash, I would stay at The Beach House or Scallywags Resort, two cute boutique hotels just next door. The most entertaining part was what happened to Eileen on our first night. She wrote, “Had a mishap last night when I couldn’t turn the lights out and the guy from the hotel had to help me. Was way more complicated by the fact that I was locked in my room like Rapunzel.” This was due to the fact that she turned in early being jetlagged but there is only one key for the room, and therefore we locked her in before having a night cap at the Irish bar across the street. When someone came in response to her phoning reception for help, she couldn’t open the door to let them in. Our afternoons consisted of relaxing over spa treatments for incredibly cheap prices, yet ranged in quality and included pedicures, massages, body scrubs and ear candling (or at least that last one was just me) all to the tune of soothing music. I was tempted to get one of the fish pedicures where you put your feet in a small aquarium and let them nibble off your dead bits but was concerned about hygiene so opted out. Every night around 6 pm we would ride the Triplets to the west side of the island for a spectacular sunset. Bingtang in hand, we’d overlook the foggy backdrop of Bali’s famed Gunung Agung in the distance while pink, orange, and blue hues would magically change tones until the sky went black. Most places would also have fire pits and local entertainers doing impressive fire tricks and I was grateful that Louise showed me how to slow my shutter speed so I could capture some awesome action shots. Then came another challenge, riding in the pitch black dark, iPhone in hand to light the way as we peddled back to the bustling restaurant strip. Dinner each nice was also a treat. It’s not uncommon for quality restaurants like The Beach House and Scallywags, amongst a few others, to have fresh seafood on display. The drill is you pick your seafood from an ice chest of lobster, prawns, fish, and more. They weigh it and once you give your nod of approval they immediately throw it on the grill. While you wait for it to cook there is a free salad bar. Lobsters averaged about $50, so the three of us shared one. Another night I had pepes, fish grilled in banana leaf. When we weren’t dining on seafood there were a range of options including the local staple nasi goreng (fried rice) to Thai and tons of western food. In fact, the most surprising element of my whole trip was how abundant western food was. I’m used to dining in countries where it’s okay to try the local stuff, in fact it’s encouraged, but this time around there was a lot of playing it safe. One of the most interesting days on Gili T was jumping onto the Triplets and discovering the whole island. We rode around feeling like we were the stars of Eat, Pray, Love. We first stopped off on the east side and sat under thatched roof huts drinking lime fizz while sun baking. We BYOS (bring your own snorkel) so it was very convenient to be able to laze around and then hop into the crystal clear water for a quick underwater exploration. Funnily though, when we asked for a snack from the large proprietor who was an enthusiastic fan of Bruno Mars, we received the reply, “the kitchen is closed. The chef is still asleep.” That’s island time for you. We were getting hungry for lunch though so hopped back onto the Triplets and took them for a ride in search of the remote, colorful beach hangout/restaurant/accommodation, The Exile. Riding down the dead center of the island, carefully maneuvering the bikes to avoid large rocks and unexpected holes in the dirt path, we witnessed where the locals stay when they’re not servicing the hordes of tourists. Horses and cattle grazed behind coconut trees, children raced their bikes, and workers hammered away further transforming the island to accommodate for more tourists. 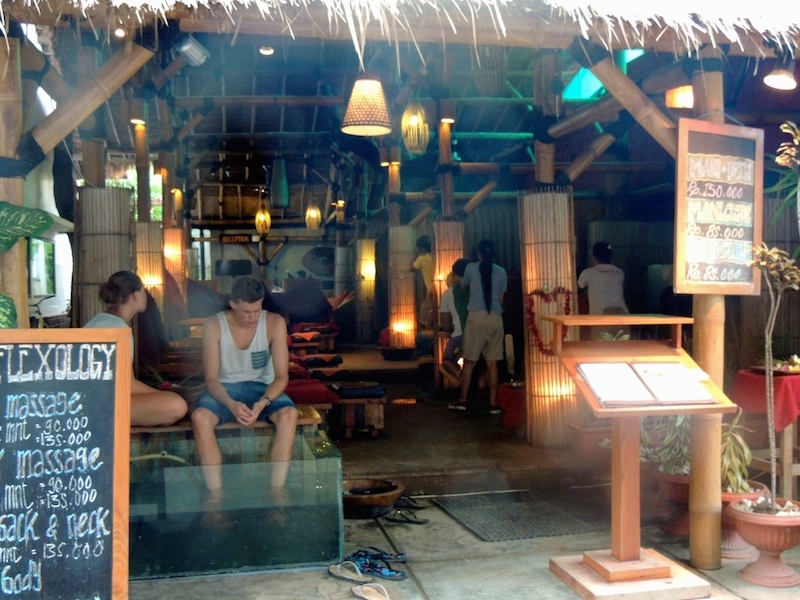 In the evenings the various restaurants would turn into island clubs, with live music, reggae or remix popular international artists set to the tune of a relaxed beat. Like a wolf pack, the nine of us (us girls accompanied by a few of Louise’s volunteer friends) all hopped onto our bikes, rode through the dark streets after watching the sunset and eating $5 curries at a small Thai restaurant tucked away off of the main strip. We then settled on a night out dancing at Suma Suma where we drank Bintangs until the early morning, soaked ourselves in sweat, and listened to a local cover band do a heart wrenching rendition of Stand By Me and then hand the stage over to an Indonesian Rastafarian who imitated Bob Marley. What was most surprising was the amount of locals interspersed with the tourists, singing at the top of their lungs – many of which looked well under 18.